Recent release “What’s The Deal with My Sign? An Insight on Astrology” from Page Publishing author Lamar Young is both entertaining and informative; this work explores the various aspects of zodiac signs and astrology. 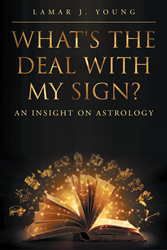 Lamar Young, a school counselor and advisor, astrology guru, fan of astrological science, devoted writer and author, has completed his newest work, “What’s The Deal with My Sign? An Insight on Astrology”: the ultimate guidebook to understanding the zodiacs signs and discovering more about one’s self. Published by New York City-based Page Publishing, Lamar Young’s fascinating work delves into the ideas of self-acceptance and understanding. Author Lamar Young asks readers, "Do you want to know quirky things about your zodiac sign? Do you desire to know what makes other zodiac signs tick? Or, maybe you want to know if you should pursue a relationship with another person. Then, ‘What’s the Deal with My Sign? An Insight on Astrology’ is a must read." Young takes a unique perspective in helping readers discover the unique intricacies about the twelve zodiac signs. From knowing how signs are related through the four primary elements of fire, earth, air, and water to the more clandestine astrology topic of modes, this book provides readers with a way of looking at themselves and others differently. Whether the reader is an old pro or a newbie to astrology, "What’s the Deal with My Sign? An Insight on Astrology" is sure to satisfy anyone’s cravings on how to get the best out of themselves and others. Readers who wish to experience this mesmerizing work can purchase “What’s the Deal with My Sign? An Insight on Astrology” at bookstores everywhere, or online at the Apple iTunes store, Amazon, Google Play or Barnes and Noble.